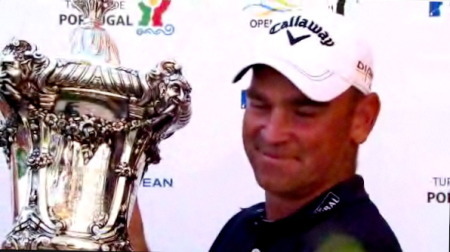 Thomas Bjorn’s four-year wait for a European Tour victory was made to seem even longer by Damien McGrane. Playing in the penultimate group, the Kells man kept Bjorn waiting as he finished with five expensive bogeys in a row to slip to fifth place behind the triumphant Dane in the Estoril Open de Portugal. Victory for McGrane was always going to be a long shot as he began the day five strokes adrift of 39-year old Bjorn. But he will have been disappointed to eventually finish ten shots off the pace as Bjorn closed with a 68 to win by five strokes from the Australian left-hander Richard Green on 23 under par. Having opened with a 64 to a 75 by Darren Clarke and led the Dungannon man by 12 strokes at one stage of the second round, McGrane finished up just one stroke better than his fellow Irishman at the end of the week as Clarke closed with a best of the day 66 to come home tied for sixth. 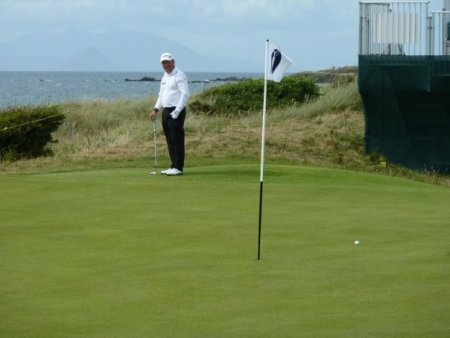 McGrane earned a tasty €42,400 for his week’s work, yet it’s unlikely he bothered punishing himself by working out that his sloppy finish for a one over 73 cost him €44,455 - his potential share of second place with Green. Like Bjorn, Clarke has been conspicuous by his absence from golf’s elite for the past few years but having flirted with the cut on Friday morning, he played his last 45 holes in 14 under par - following his 75 with rounds of 67, 68 and a 66 to share sixth place with England’s Robert Coles on 12 under par. Bjorn’s victory was his first since he claimed the Nissan Irish Open in a Monday finish at Carton House in 2006 and he did it in style. Three ahead of Green starting the day, Bjorn birdied at the fifth and sixth but was just one clear of Green with five to play as the Australian played his first 13 holes in four under. However, there was a decisive four-shot swing in the Dane’s favour over the next two holes as he birdied both the 14th and to 15th to bogeys by Green to open up a comfortable five stroke lead and come back from the cold after years of troubles with poor form, injury and illness. The man from Silkeborg bogeyed the 16th but after a long wait for McGrane on the par-five 18th, where the Meath man drove into the trees and took six, Bjorn laid up and then almost holed a wedge for an eagle three. After tapping in from a couple of inches for a closing 68 and his 10th European Tour win, Bjorn said: “It’s very special. When it has been a long time coming it is even more special for those reasons. You sometimes gets into this stage in your career when things just come easy to you but it certainly hasn’t been easy for me for a while. I am very pleased with this one. “It’s been too long. Maybe I’ve gotten in my own way a little bit at times and gotten very hard on myself. And the confidence slipped with not performing on the golf course. This year I set out to try and be as strong as I could be and keep believing and believe that the talent was going to come through and the results were going to come. “I’ve been struggling quite a bit with my health but I am in good shape at the moment trying to get strong er and fitter and that should see me into my forties, which is coming around too soon. “I don’t want to be out her and not compete. I have always driven myself very hard and in the rough times you have got to try and drive yourself even harder. You have got to drive yourself very hard and work harder than the next guy. I believed it was going to come around eventually. Gary Murphy finished tied 43rd on three under after a closing 72. McGrane makes peace with retirement as young guns step forward: "Guys like me have to step out of the way and let them off"
Damien McGrane wants to keep his pride and retire from the European Tour this week as a new generation of ultra-talented tour stars battles for a place in the sun. Damien McGrane has over one million reasons to be happy with his career - but no amount of money can dampen his desire to win. The Kells kingpin has moved over the €1 million mark in European Tour earnings - banking a massive €1.15 million over the par four seasons. Some would say that €1 million in not a bad return for 35-year-old guy who was a club professional selling mars bars and giving lessons at Wexford Golf Club just a few years ago. But McGrane has been playing golf for money for a long time - winning the domestic Order of Merit three times in a row - and he while he's a late-comer to the European Tour, he feels he's ready now to run with the big dogs and grab that elusive first victory. Damien McGrane opened up with all guns blazing as he carded an impressive eight under par 64 to set the pace with English rookie Luke Goddard in the Estoril Open de Portugal at Penha Longa. Damien McGrane couldn’t match the fireworks of his opening 64 but was still happy to card a two under 70 that leaves him just two strokes behind leaders Thomas Björn and Carlos Del Moral in the Estoril Open de Portugal. Damien McGrane admitted he failed to read the local rule and was justly disqualified from the French Open in Paris. Pic: golffile.ieDamien McGrane complicated an already difficult season when he failed to read a local rule and was disqualified in the opening round of the Alstom Open de France. The Meath man, who was ranked a lowly 103rd in the Race to Dubai standings starting the week, was one of four players given their marching orders by Chief Referee Andy McFee for taking an incorrect drop on the water-protected, par-four 18th.